Looking for more cool attractions to see while in Paris such as Paris Catacombs tour? You must download our Free 4-Day Paris Itinerary! The Catacombs are one of the most-visited tourist destinations in Paris, as it brings together people from all over the world to admire the ancient labyrinth of Paris’ past. 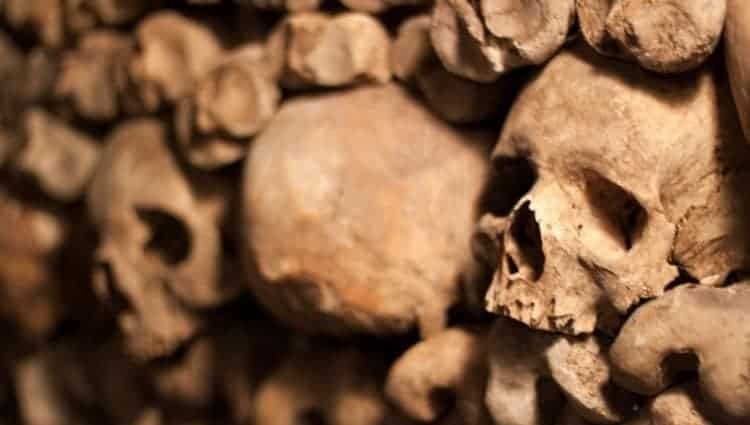 This guide explains everything you should be aware of before planning your Paris Catacombs tour. Read on! Planning for your Paris Catacombs tour requires as much preparation as visiting the Louvre or Versailles. We have listed all our best tips to make sure your visit there is optimized and trouble-free. The catacombs were originally formed in order to create present day Paris. Many of the limestone walls seen through out the city come from deep underground where builders sourced the original stone. The catacombs sit at about 20 meters under the city streets – that is equivalent to a five story building! View of an old engraved board in the Paris catacombs with skulls and bones all around it. Make sure to check out the ossuary. This portion of the catacombs is where all the famous bones are held. This will be a once in a life time experience to immerse yourself in a completely different world! Nothing about this visit is ordinary with rows as far as you can see made out of the skeletons of the ancient dead! HOW MUCH TIME DOES PARIS CATACOMBS TOUR TAKE? If your schedule is already packed with activities and the Catacombs are still on your bucket list of top places to visit in France, you will need at least 45 minutes to see most of the catacombs. We recommend to see in priority the ossuary and walk quickly through the limestone passageways. To visit most of the catacombs and not rush you will need a good 1 and a half hours. The catacombs are divided in two parts. The limestone passageways will take approximately 15 and the ossuary will take 45 minutes. 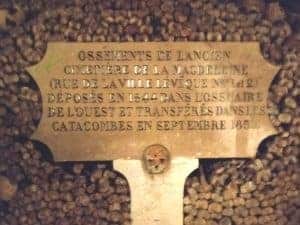 HOW LONG IN ADVANCE SHOULD YOU PLAN YOUR PARIS CATACOMBS TOUR? You can get tickets for Paris Catacombs tour on the monument’s official website. Two important info, same as many tourist site in Paris, tickets usually sell out weeks in advance. And there is only one type of tickets available for online purchase: skip-the-line tickets with an audioguide which costs 29€. Buying your ticket on site is for sure the easiest and cheapest way. But there is no way to skip the line. Read our recommendations for when to visit to get our tips on how to avoid the long line for the catacombs. Regular tickets bought on site costs 13€. Our suggestion for Paris Catacombs tour is to consider visiting it with a guided tour which will provide you skip-the-line tickets and special access to off-limits access to the nicest part of the catacombs where regular individual visitors are not allowed to go to! One company specialized in this type of off-the-beaten track exploration is Localers! WHEN IS IT BEST TO DO PARIS CATACOMBS TOUR? The best time for Paris Catacombs tour is during the week. On weekends, the Catacombs tend to be more crowded as many French locals will take their weekend time to do a cultural activity. The worst day for Paris Catacombs tour is Tuesday as most of public museums are closed. During the low season from Wednesday to Friday, around 3pm in the afternoon, the line is usually not too crazy. Check this great French website to optimize your visits schedule in Paris. The line will be very long during high season so get ready to wait in line no matter what time you arrive. Sometime the line can be 4 hours long, it is very important to plan well ahead and get there before the opening time – 10am. We advise to get there at 8am get a take away coffee and some tasty pastries at Moisan – the delicious bakery on the other side of Denfert-Rochereau square and be patient! On the busiest day, even if you get there before the end of the afternoon the line is so long that you might never get in. We also suggest avoiding rainy days as many people choose this activity when the weather is not great. HOW TO GET TO THE CATACOMBS? The catacombs are located in the South of Paris. They can be easily reach using metro lines 4 and 6 and getting off at Denfert-Rochereau. Find out the easiest itinerary to get there. The suburban train line RER B connecting Charles de Gaulle airport up North to Paris city center and Orly airpot down South, stops at Denfert-Rochereau as well. Taking RER B from Chatelet-Les-Halles station is only a 3 stops ride to the Catacombs. Ticket for the RER within Paris’ limits are the same than regular metro tickets. For more information about tickets and transportation in Paris check this article. Bus lines number 38 and 68 stop nearby the Catacombs. Use the same tickets than in the metro and the RER. Here is the complete itinerary of bus 68. Here is bus 38 full route. Looking to make your visit one of a kind? The INSIDR team was invited to explore the Catacombs with the Localers‘ tour company and we were so excited to learn so many cool and unique facts! Unfortunately, most people miss a majority of the significance and history behind the artifacts, but with our tour guide, we were not only able to hear all the cool stories, but see extra special parts of the Catacombs as well! Make sure to go with a Localers guide to see the best sites and hear all the interesting facts and stories of the Catacombs. We recommend attending the Localers‘ Paris Catacombs tour in order to skip the massive waiting line. You will also be given the personal phone number of your guide ahead of time so that if you have any trouble accessing the site, help is just a call away. Localers makes sure to deliver the best tour for your needs making this visit as seamless and easy as possible. And only for INSIDR travelers benefit from 10% off your online – purchase by using the discount code “INSIDR”. Start by entering into a secret passage way, only accessible by the Localers guide. You will learn the awesome story of the Port-Mahon corridor and the ghost of the infamous artist that haunts his beautiful and magical carvings. As you continue on, you will learn about the upkeep and history of the catacombs as well as the jokes played on innocent tourists 100 years ago! You can spend extra time in the ossuary where you can relive the history of the Catacombs through the stories behind each inscription and statue. Walk among the millions of bones and become an archeologist as the Localers guide describes the history of the underworld and remains of Parisians past. If you are looking to explore the area and keen on delicious restaurants and authentic French boutiques, then head to Rue Daguerre! This street will be sure to amaze you with a collection of colorful and local flavor! Check our map above to spot Rue Daguerre. Are you looking to get a culture fix? We recommend the gorgeous Fondation Cartier which is just a hop and a skip away from the Catacombs. This museum may be smaller than the Louvre but holds an amazing collection of modern art for culture lovers interested in contemporary fashion, film, architecture and more! Check our map above to spot Fondation Cartier. Delicious Italian restaurant serving an incredible home-baked bread and some of the best pastas in town. La belle ronde is a delicious casual and very affordable creperie where they serve delicious crepes of all kind. Every day they have a set lunch menu including: a galette (buckwheatflour crepe) + a sweet crepe + a glass of cider for 9,90€. It is without a doubt the best place to get lunch in the Catacombs area. This bakery is from far the most delicious one in the Catacombs’ area. They only use organic flour from French mills for they bread. Don’t mis their signature treat: the brioche feuilletée, a fluffy, buttery bread made of many layers of crust. Now that we’ve explored the underground, how about going onto the rooftops and enjoy the best view in Paris from the above?